Raising-Rabbits is Celebrating Four Years Online! November 17, 2013 will mark 4 exciting years online for Raising-Rabbits, and we want to do a little bit of celebrating! To provide complete rabbit information, instructions, pictures and breeder support for every facet of raising and breeding rabbits as pets, or for meat, show and fur. To support this mission, we are working hard to complete our World of Raising Rabbits ebook series. 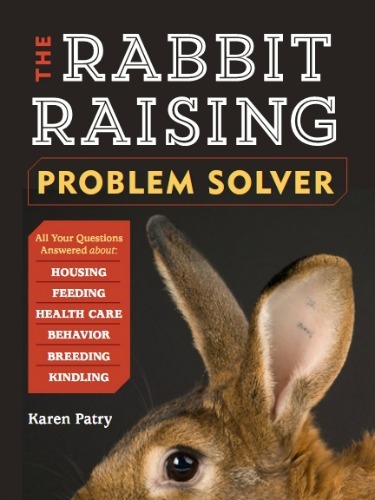 Plus, Storey Publications will soon publish our question-and-answer book: The Rabbit Raising Problem Solver. Expect it on bookstore shelves in Spring of 2014. The Raising-Rabbits website was just a year or two old when I realized that one cannot possibly convey all one needs to know about rabbits through web pages alone. At least, not logically. To further the mission of providing complete rabbit raising information, I decided to create an e-book series called World of Raising Rabbits and offer it on the Raising-Rabbits website. I'm excited to finally be able to work toward providing our readers with all the info you've been searching for! The e-books will use the content of Raising-Rabbits as a framework for providing "complete rabbit information." And while the info on Raising-Rabbits is very good, an e-book format allows me to expand the information and say everything that should be said on every important topic. That makes me happy! 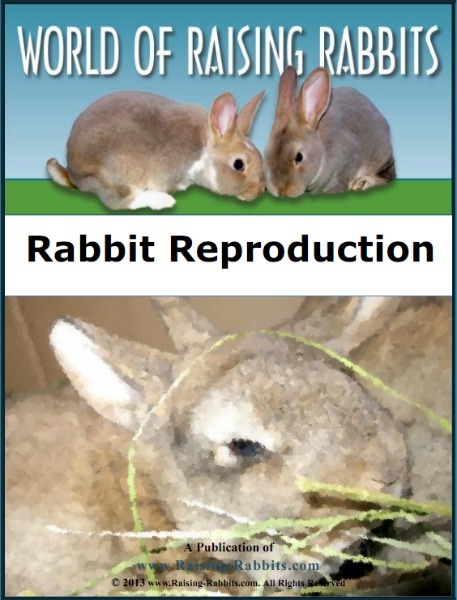 As an example, take our latest, recently produced e-book, titled Rabbit Reproduction. This e-book covers very important facets of raising rabbits - breeding, pregnancy and kit care. 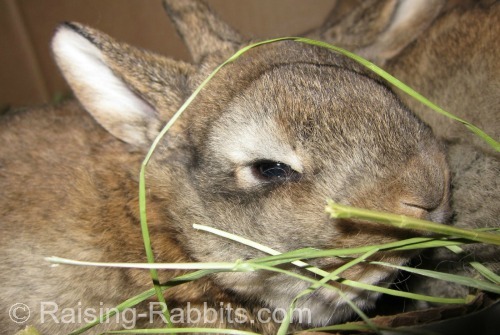 It starts with mating rabbits, and takes you through pregnancy, kindling, baby rabbit care, and weaning. It shows you how to address various possible problems you might encounter with does, bucks and babies, addresses feeding the growing bunnies, false pregnancies, and what do do when you're shocked to discover a furry nest of baby rabbits in with your "two does." Rabbit Reproduction uses as a framework the fourteen or fifteen pages of our breeding section, which you can find online for absolutely free. The information is good. It needs to be included, but it comprises less than a third of the total e-book content. At 108 pages, we’ve clearly enhanced and rounded out everything we know about rabbit reproduction. What you can obtain for free on the website is STILL FREE to you, even though the very reasonably priced e-book contains the information. At just $8.49, the e-book will be worth double or triple what you pay, especially if you save even one kit from dying by implementing what you learn in the e-book. AND...! Until the end of November, 2013, we are offering a 20% discount on the price of the e-book. From now until the end of November, you can obtain Rabbit Reproduction for a measly $6.79. The price will revert to the regular $8.49 on December 1, 2013. But wait! How would you like instead to get the e-book for just $3.40?? Yep, if you help me out by reviewing the e-book and giving me your feedback, I’ll REFUND half of your money. That’s on top of the 20% discount! I just need to hear back from you within 45 days of your purchase. This offer is extended to all purchases during the month of November, 2013. I’ve read through the e-book so many times that my eyes glaze over - I know what it’s supposed to say and mean, and if there are any errors or typos left, I'm sure not seeing them any more. That is why your help would be invaluable to me. Can you find any typos, mistakes or oversights?? Go to Rabbit Reproduction for all the details about our new e-book, and to place your order. Our next e-book will discuss rabbit genetics. We'll follow the same plan - include and enhance all the completely free genetics information that is on the website right now, and then triple or quadruple the depth of information and photos so you receive over and above your expectation, and much more than you pay for. In late 2011 I realized that a question-and-answer e-book would greatly help to answer many of the individual and unique questions that come into the website every day, as well as the repetitive ones, such as, "is my rabbit pregnant." But before I could write the e-book, Storey Publications got wind of the project, and wanted to publish it as a traditional book rather than an e-book. That worked for me! Who wouldn’t want the help of the folks who published the best book ever on raising rabbits - Raising Rabbits by Bob Bennett? My work on the e-books stalled. I suddenly needed to create an enormous Q&A format manuscript that would answer a mind-boggling number of questions I’ve received over the years, questions covering every conceivable facet of raising rabbits. The manuscript ended up shooting past the initial 250 page target. I think it will end up being in length somewhere between 280 and 310 pages. It's been over a year and a half since the beginning of the project. There were days I felt like I was letting my visitors down, as I was immersed in writing and couldn't seem to answer all the queries that continued to come into the website. But thankfully, the hard part is past, and the release date is getting closer - Spring of 2014. As a way of saying Thank You and in celebration of our 4 years online, I’m dying to give away copies of Rabbit Raising Problem Solver! We will hold a contest soon at our Facebook page, so keep an eye out for contest criteria which I will post there in the next few weeks! Your friends at Raising-Rabbits.com wish you a wonderful and blessed Thanksgiving this November 2013.